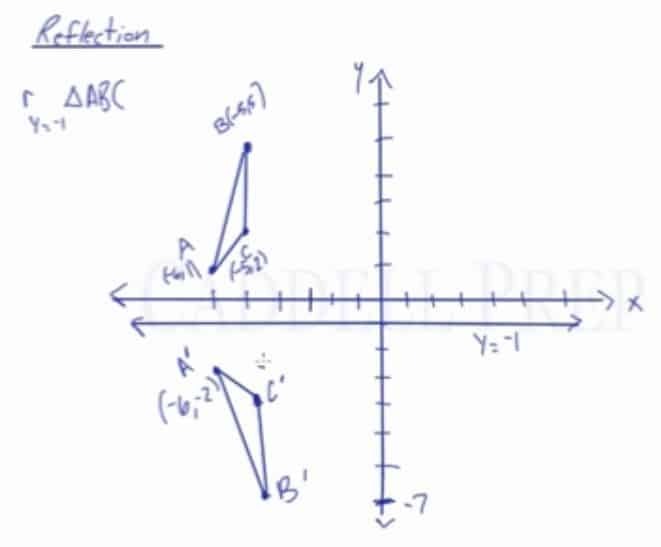 In this video, you will learn how to do a reflection over a horizontal or vertical line, such as a reflection over the line x=-1. Let’s use triangle ABC with points A(-6,1), B(-5,5), and C(-5,2). Since the line of reflection is no longer the x-axis or the y-axis, we cannot simply negate the x- or y-values. This is a different form of the transformation. Let’s work with point A first. Since it will be a horizontal reflection, where the reflection is over x=-3, we first need to determine the distance of the x-value of point A to the line of reflection. We’ll be using the absolute value to determine the distance. The procedure to determine the coordinate points of the image are the same as that of the previous example with minor differences that the change will be applied to the y-value and the x-value stays the same. Let’s say we want to reflect this triangle over this line. A line rather than the -axis or the -axis. This line is called because anywhere on this line and it doesn’t matter what the value is. Graphically, this is the same as reflecting over the -axis. We’re just going to treat it like we are doing reflecting over the -axis. Let’s see how far away it is. Point is units from the line , so we’re going units to the right of it. Keep the same height. And we have . Same thing for points and . is units away so we’re going to move units horizontally and we get . Point is units from the line so we go units to the right and we end up with . The reflection of triangle will look like this. Probably it’s best to do this graphically then get the coordinates from it. Similarly, let’s reflect this over a vertical line. This line represents because anywhere on this line is , it doesn’t matter what the value is. We’ll treat this the same way as we treat everything so far in reflection. Point is spots away from the axis so we’ll go spots below it. And we end up with . is spots above the line so we’ll go spots below it. We end up with . Point is spots away so we’ll go spots below line. Now, we can draw a triangle. We’re able to get the new coordinates graphically by graphing it. As we look at it, we can now figure out the coordinates. A quick sketch easily helps us figure out the coordinates for the image if we reflect triangle over the line .